Manchester United midfielder Paul Pogba reached a personal milestone after he scored a brace to help his team beat West Ham 2-1. The Frenchman scored twice from the spot to take his tally to 13 goals this season. When coupled with his nine assists, Pogba now has been involved in 22 goals in the Premier League this season. He has never been involved in more goals in a season during his career. His previous best tally dates way back to the 2015/16 campaign when he scored eight goals and recorded 12 assists for Juventus in Serie A. At United, his numbers had peaked in 2017/18 season. The Frenchman netted six goals and made 10 in that campaign. Pogba is enjoying statistically his best season yet and has five more games to take it further. Seven of the goals he has scored in the league this season have come from the penalty spot and he has clearly made the best of being the primary penalty taker for United. The midfielder has been crucial to United’s resurgence under Ole Gunnar Solskjaer and the team needs him at the top of his game, should they hope to finish in the top four. Anderson levelled with a sliding finish four minutes after the resumption, while substitute Michail Antonio rattled the bar before his downward header was clawed away by De Gea as West Ham looked for a winner. 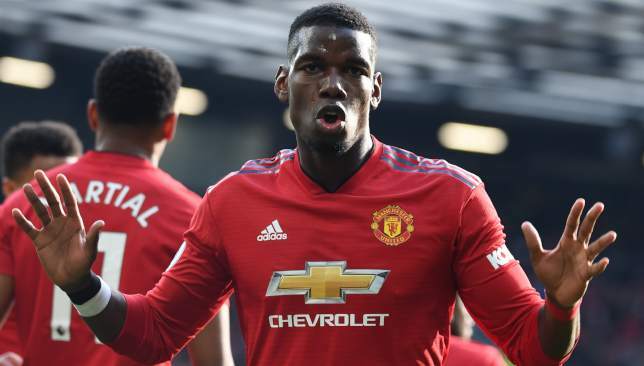 Manchester United needed two Paul Pogba penalties to scrape home to a 2-1 win over desperately unlucky West Ham. Old Trafford’s visitors fell behind in the first half when Robert Snodgrass clumsily felled Juan Mata – Pogba stepped up and swept United into a lead they barely deserved. After the break the Hammers stepped things up and levelled through Felipe Anderson. After that they could easily have won it with Michail Antonio hammering the crossbar and David De Gea making a gravity-defying save from the same player’s header. 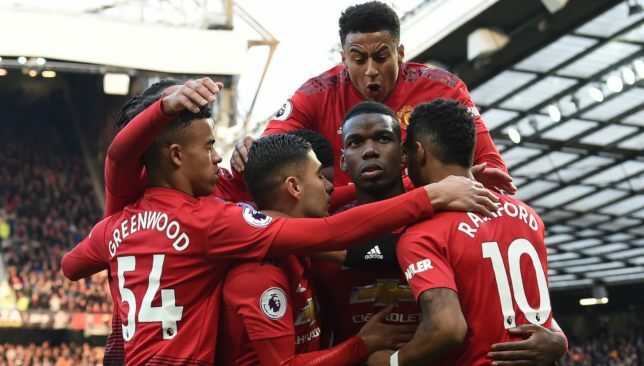 In the end, Ryan Fredericks’ brainless foul on Anthony Martial allowed Pogba the opportunity to drag United out of the fire, and he smashed in his second effort from 12 yards. At the beginning of another pivotal week, those basking in the Manchester sunshine watching this game may have been forgiven for thinking it was May, instead of April. United have a mammoth European night to come on Tuesday in Barcelona and remain outsiders of the four teams looking to secure a top-four finish. And yet here they were, and have been in recent weeks, playing with the care-free attitude of a team who have nothing left to play for this season. But it is one that is very much still alive, or it should be. So why are a team in the midst of their most critical phase playing so casually? The ponderous Pogba is a large part of the problem as all United’s play goes through him – while Mata and Romelu Lukaku are hardly conduits to the speedy style United fans crave. After an encouraging yet ultimately fruitless result in midweek against Barca, United were desperately in need here of a performance full of whim and vigour – to fire their Champions League chase back up, for both this season and next. And yet, the visitors enjoyed 56 per cent of possession in the first half and will leave Old Trafford wondering how on earth they contrived to lose. This was not a result or performance to fuel the imagination ahead of their clash in Catalonia. 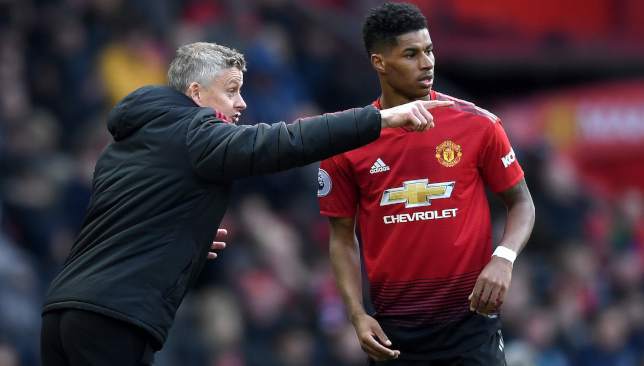 As if to point out the blindingly obvious tentative and terse style of United’s play, the home side actually looked at their best when the pace and ingenuity of Marcus Rashford was introduced off the bench. That came in the 55th minute and was not a substitute Solskjaer would have wanted to make if at all possible, with Tuesday in mind. The Wythenshawe wonderboy has played a lot of football under the Norwegian and he would surely have preferred to keep him wrapped up and ready to unleash on Barca. But, by sticking him on the bench, Solskjaer was possibly also mindful of the fact he might need an injection of speed to spring United into life – and so it proved. Rashford brought the Stretford End out of its slumber minutes after being introduced when he latched onto Chris Smalling’s through ball and unleashed a stinging shot that was saved superbly by Lukasz Fabianski – United’s clearest chance of the game. He then sent a header over and, together with Mason Greenwood, helped United stretch West Ham at the back and regain some semblance of control after they equalised and threatened to take more than a point back to east London. With Lukaku off and Martial moving centrally, it seemed to instantly reinvigorate United’s forward play. It’s the way forward for midweek. United won’t get away with such a static start at the Camp Nou. On this showing, as well as sporadic evidence throughout the season, there’s no reason why West Ham should not be in the hunt for seventh place. In fact, they have legitimate reason to be the chasing pack’s No1 team. But their squad – both talented and top-heavy with luxury players – is the reason why they should, and also shouldn’t, be there. Marko Arnautovic, Manuel Lanzini, Samir Nasri and Felipe Anderson are a terrific quartet of weaponry to have in your armoury, and yet trying to fit them all in the starting XI has been a conundrum Manuel Pellegrini has wrestled with throughout the campaign, and often to the detriment of the rest of his many unheralded stars. Declan Rice – excellent at Old Trafford – has come from nowhere to establish himself as one of the finds of the season, Robert Snodgrass has reinvigorated his career at the London Stadium, while Pablo Zabaleta and Mark Noble continue to defy the critics and Father Time. 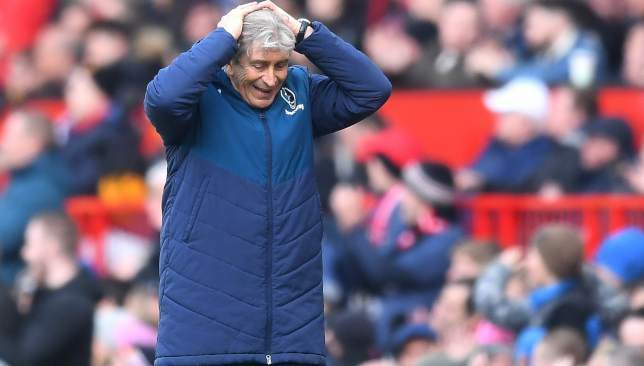 Pellegrini also wrestled with whether to keep or sell Arnautovic in January – the effervescent Austrian is as maddening as he is marvellous. He seemed happy to stay, much to the delight of the fans, and yet his performances since the turn of the year have clearly dipped. He was left out of the squad here due to apparent illness. Perhaps the best thing was to allow him to leave after all. Judging by the grit and guile on show at Old Trafford, inflated egos are no longer a luxury West Ham can afford to carry.